This Friday, I attended a conference in Orlando, FL for Reading with TLC. It is a program for reading that is a multisensory approach. It has ideas from Orton-Gillingham as well as LiPS. What is mainly different about it (that I LOVE) is the adorable letters! 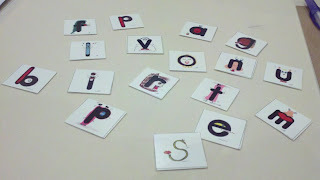 They use letters that have a mnemonic/story attached to each to help children remember the sounds connected. The stories really are cute, and easy to remember, and the kids that I have used it with have absolutely loved it. They have a lot of information on their website. The program is relatively inexpensive to get the materials (how refreshing). The multisensory approach is a proven technique that works. Love that they took a proven method and added a twist to help it appeal to different children. Visual Supports - Guess Who? Decorate your speech office with Blik!